Antonio Blanco Antonio Blanco was born on September 15, 1911, in Manila, the capital of the Philippines. Both of his parents were Spanish, a fact that Blanco believed linked him geographically and spiritually to Miro and Salvador Dali. His father settled in Manila during the Spanish - American War, where he attained prominence as a physician. Blanco was educated at the American Central School in Manila. During his high school years he loved the arts, literature and language classes but struggled in scientific subjects. It is no wonder that he spoke six languages - Spanish, French, English, Tagalog, Indonesian and a bit of Balinese. After completing high school in Manila, Blanco studied at the National Academy of Art in New York under Sidney Dickinson. During those early formative years, Blanco concentrated on the human form, fascinated by the female body more than any other subject matter. To further his studies and ignite his traveling spirit, he traveled extensively throughout the world before he finally landed in Bali in 1952.The King of Ubud gave Blanco a piece of land to set up his home and studio in Campuan, Ubud, at the confluence of two sacred rivers. Blanco and his Balinese wife, the celebrated dancer Ni Ronji, lived in their mountain retreat, barely leaving it for the world outside. Following a brief trip to the United States, where Blanco acquired many new collectors, the couple never left their fantasy home again. Living in serene surroundings with his four children, Tjempaka, Mario, Orchid and Maha Devi, Bali became Blanco's center. He was fascinated by the island and completely captivated by its charm. Blanco lived and worked in his magical hilltop home until his death in 1999, feverishly creating his fantasy portraits of beautiful women. Surrounded by lush gardens, rice fields and with a Banyan tree standing over his family's temple, Antonio Blanco proceeded to create a new reality for himself. His artistic outpourings of this isolated world became much sought after by eager art lovers, collectors and promoters. 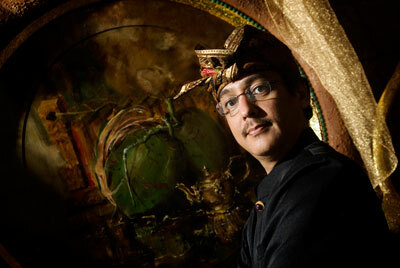 Within a few years, Blanco became the most famous foreign artist to make Bali his home. He was recognized in both Indonesia and abroad, receiving numerous Blanco Awardsand commanding huge prizes at international auctions. By the end of his life, Blanco had begun building his museum at his studio in Campuan. Dramatically, he died just before its inauguration. His funeral was marked by a very important Blanco Cremationin Ubud. It was Blanco's dream to turn his studio-mansion into a museum. His son, Mario, fulfilled this dream by following his path to become a painter. The Blanco Renaissance Museum is now open to the public, exposing both the maestro's and Mario's art works..
To learn more about Antonio Blanco, purchase the book "Fabulous Blanco"